Me: You are the world’s greatest plagiarist, do you know that? Why can’t you manufacture words of your own? I: How can I? I am at a loss for words. I do have thoughts of course, thoughts that perturb me to no end even if they are “airy nothings”. Besides, even if I speak out, who’ll listen? Me: Ha, there goes the plagiarist again! For all these years you have been tiring me out with your quotations. I have no choice. I am doomed to hear your ranting for the rest of my life. So, why not lad? Go ahead. Bore me with your wisdom. What makes you so sad today? You had better speak audibly. Even if you don’t, I can’t help hearing you of course. God designed us that way. But if you’re audible, a few others might hear you too. I can at least share my grief with others. I: You know what? This is not the first time that you’ve advised me this way. But your advice hasn’t taken me too far. The world is so unjust. My life is full of sighs. Me: Look man, don’t behave like a mock turtle. Speak boldly about your concerns, just in case someone’s eavesdropping. I: OK, OK. Can’t do me too much harm if I follow your advice one last time. Well, I am sad you see about this mythical character called Lady Justice. She is blindfolded and holds a sword. Can she really deliver justice in this state? Me: What gibberish! You amaze me … You are a personification of indolence. Don’t you work at all? Anyway, go ahead. I: If my question brands me as indolent, then the entire world has been so from time immemorial. It appears that viewing Justice as a blindfolded woman, holding the scales of truth and fairness dates back to ancient Egypt. The Egyptians called her Goddess Ma’at, and later Isis. The word Ma’at expanded to “magistrate” a few thousand years later. Me: Ha! You’ve been googling I can see! You are not that lazy a bum after all. I: You are right, but can’t you see how gloomy the scenario is? Me: Gloomy? Why my dear fellow? I: Why not? I am worried if there has ever been any justice in this world at all. The Roman Empire replaced the ancient Egyptian legal system with its own laws, but it stuck to the image of a female god. Named her Justitia and made her hold a sword as well, over and above the scales I mean. She was blindfolded of course. Me: Oh really!! Right … but can we carry out what’s threatening to be a somewhat tedious and long discourse over a generously topped pizza? I: Look, try to concentrate please. Pizzas make you gain wait and you carry enough weight as it is. Listen to this instead. Modern courts too use a similar icon, mixing the Roman blindfolded Fortuna (Luck) with the Greek gods Tyche (Fate) and the sword-carrying Nemesis (Vengeance). Always a woman and blindfolded at that. Why should a blindfolded woman be more righteous than a blindfolded man? Me: I suppose people believe women are more honest than men, generally speaking you know. They are less likely to remove the blindfold and peep at things when people are not watching. I: If that’s what you think then you have either forgotten or have never heard of Gandhari’s tale in the Mahabharata. Google has a lot to say about the matter. Me: Of course I haven’t forgotten. I know every little detail about her total devotion to her husband. I know very well that she denied herself the use of her eyes simply because her husband was blind. Had it been today, she would definitely have donated one of her eyes to the poor husband. The entire Kurukshetra battle could have been avoided in the process. But the possibility didn’t occur to Vyasdeva. Recall that Valmiki had created a flying chariot long before the invention of airplanes. Imagination-wise, this Vyas guy was a bit of a failure if you ask me. I: Now wait a bit, just wait a bit. Gandhari was not all that honest even according to Vyas. Her blindfold was somewhat loose. She could actually see. Me: Oh really? How did this piece of intelligence arrive at your door? I: It knocked on your door too, only you refused to respond. Google more, that’s my advice to you. Let me remind you first that the Mahabharata does not end with the Kurukshetra battle. A great many events keep on happening even after Duryadhana departs. And there is this extensive section called Stree-Parva, where millions of widows wail as they curse the Pandavas for packing off the Kauravas lock, stock and barrel. Of course, Gandhari did not face widowhood, but she lost each one of her hundred sons. Her pain was infinite, even though she was no doting mother to Duryadhana. Each day of the Kurukshetra battle that the son asked for her blessings, all she had to offer was “yato dharma stato jayah“, or, in other words, “let dharma be the final winner”. In fact, she had never quite believed her first born to be a favourite of Lord Dharma himself. Nevertheless, the loss of all her sons caused her immeasurable pain. Even Yudhishthira, who played an important role in disposing of the sons, was mighty scared to come and ask for her forgiveness. He was aware of course that like many others who lived in that age, she could set divine retribution in motion. Nonetheless, he touched her feet even as he shook in fear that a curse or two were about to descend on him. And as I said, her eye band was not all that tight. It was loose enough to leave a chink near the bottom edge to allow her to peer through. She was definitely able to see a part of the ground she stood upon as clearly as you ogle at your neighbour’s wife. Me: Really? Is this what Google’s preaching? I: Google’s not preaching. It is quoting eminent authorities on the Mahabharata in support of the claim. Taking advantage of this not so tight blindfold, she managed to aim her gaze on the tips of Yudhishthira’s fingers as they crawled uncertainly towards her feet to grab them in search of forgiveness. She did forgive perhaps, but her anger took a while to subside and her eyes spewed fire in the meantime. Yudhisthira’s fingernails suffered from a direct hit and turned jet black for the rest of his life. He was a mighty King thereafter, but with twisted, ugly claws instead of manicured nails. Women need not be impartial, even if their eyes are tied or appear to be tied. Me: Funny that the cloth that bound her eyes did not catch fire! I know you don’t want me to crack silly jokes. But I can’t help it. The fact that the fire emerging out of Gandhari’s eyes didn’t burn up the cloth reminds me of an observation that Bertrand Russell made in his Unpopular Essays. It was published in 1950. I: Look, I’m not that ignorant. I have heard of Russell. But I admit that I can’t recall reading his essays, popular or unpopular. Anyway, what did he have to say about Gandhari? Me: Not about Gandhari silly, but about someone who’s probably far more mighty. God himself! He discussed what God was supposed to be able to see and what he wasn’t. It could be related to the subject we are discussing. I: Don’t beat about the bush. Just report on Russell. I am all attention. I: Curious indeed. Things are getting curious-er and curious-er as Alice of Wonderland fame might have said. Me: Probably. But I am thinking, you know. If Gandhari’s blindfold was a fake, then the ladylike appearance of Justice needs more explaining. Greek mythology too is replete with stories of totally unfair goddesses, starting from Juno herself. Hercules’ heroic deeds were mere by-products of the jealousy aroused in Juno’s heart by her husband’s extramarital affairs. Perhaps Justice is a hermaphrodite, dressed up as a woman. Not that a hermaphrodite is known to be any more just than an average woman… Hmm! But weren’t you pontificating about the Romans a little while ago? I thought you said their Goddess was named Justitia. That sounds like justice to me. Before you got me all confused with the Gandhari episode though, you indicated that the Roman Goddess Fortuna too played a role in doling out justice. Why should Fortuna have anything to do with justice? Any opinion on the matter? I: I’m glad that you brought up Fortuna. She was indeed the Roman goddess of Fortune. It made sense to blindfold her. Luck has been known to be pretty blind, at least erratic. I wonder in fact if the Romans really blindfolded the Goddess Justitia also. Justice has a clear link with Justitia and she shouldn’t be blind, should she? Could the ancient Romans have believed JUSTICE to be BLIND? Me: You have a point I can see. But I really don’t know the answer to your question. Never got a chance to exchange notes with Julius Caesar and his relatives. They’d crucify me if I asked such blasphemous questions. I: Once again man, this is not funny. I tend to believe that the Roman Justitia was not blindfolded. It was posterity that replaced her by Fortuna and that’s where the blindfold comes from. But if you think all this is a big joke, then let’s put an end to the conversation immediately. Me: OK, I will try and look as grim as possible. It’s hard, because people at my age tend to act silly. And that includes you, not me alone. Well, let me see if I have anything serious to contribute though. Umm …, yes. I understand that a statue of Lady Justice stands without a blindfold atop the Old Bailey courthouse in London. So you could be right in concluding that the Roman Justitia was not blindfolded after all. But it is also a counter-example for you. It shows that the modern world does not necessarily view justice to be blind. I: True? Are you absolutely sure about Old Bailey? Ah, what a relief. There is a glimmer of hope then. Me: Look, I am not entirely sure, but that’s what I read in Wikipedia. You should double check if possible. I: I went through Wikipedia too. And I saw that quite a few modern court houses depict Lady Justice as a blindfolded person. This is true for many parts of US for example. With the passage of time, humanity seems to have equated objectivity with caprice, Justitia with Fortuna! If that were to be the case, then justice is an instance of simple random sampling. Me: Don’t try to impress me. I distinctly remember this “simple random sampling” thing. Learnt it in college. But I have forgotten what it means. I know what sampling is of course. Sampling good food has been a hobby through my entire life. I: You are incorrigible. Always after food. Simple random sampling is just a terminology employed by statisticians. You and I came across the concept in our statistics course. It is a technical way of describing unprejudiced choice. Me: Unprejudiced choice!! What rubbish! How can choice ever be unprejudiced? I always restrict my choice to non-vegetarian dishes. Let’s order that pizza now and watch a soap opera. You too need a rest. I: Not only is your middle increasing with age, but your mind is shrinking. At least you are becoming somewhat insensitive. Can’t you understand that we are living in a world that has always maintained a warped view of justice? I can’t feel exercised over this concept of blind justice. Me: I tend to disagree. Haven’t you heard of this TV serial called Blind Justice? It is the story of a detective who was blinded during an encounter. He doesn’t opt for desk work. He continues to run after criminals. I: Come on. Let’s not turn ultra-romantic. Was Dhritarashtra an impartial person? I told you only a little while ago that even Gandhari wasn’t. The fact that you can’t see merely ensures that view-ing doesn’t distort your view-point. That’s not necessarily an advantage. A blind man could be easily run over by a speeding vehicle. I can feel sympathetic towards him, but I don’t wish to go gaga over the power of blindness. Me: OK. Then how about Helen Keller? She was very real. I haven’t heard of her being described as a whimsical person. Quite to the contrary in fact, she was highly rational. I: How many Helen Kellers has the world produced since the beginning of creation? Me: Hmm… I guess you have a point for once. I: That’s an understatement. I am not just making a point. I am questioning the entire concept of justice, at least as it is practised in human society. If the Roman Goddess Fortuna symbolizes justice, then what is the difference between going to a court and purchasing a lottery ticket? Me: How do you mean? You are turning abstruse to say the least. I: Not at all idiot, you are simply unwilling to call a spade a spade. If justice is none other than Lady Luck, then very few in this world will ever receive her blessings. Just compare the number of people who purchase lottery tickets with the ones who win prizes. Did you know that 3 million cases were pending in India’s high courts and 26.3 million in the lower courts? Actually, that was two years ago. The situation right now is surely worse. Most people will not live long enough to see justice delivered. Like the lottery ticket purchasers. A great number of them keep purchasing tickets all through life, only a few hit the jack pot. Me: It’s worse friend, it’s worse. I had actually won a lottery once and received expensive lingerie for a prize. I: Yes, yes, I remember. And you weren’t even married. Me: Indeed. I toyed with the idea of presenting the set to a girl. But I chickened out in the end and sent it back to the women’s organization that had held the lottery. I: Ha, ha, ha … And what did they do? Me: They sent me a can of dog biscuits with a note that I deserved no more. Me: Well, they argued that a man who lacked the courage to present expensive lingerie to a woman who attracted him was subhuman. I: Hee, hee, hee … That’s funny. This was one decision at least which didn’t lack justice. Me: OK, I will buy you the nicest lingerie and wait and watch. I will see what you’ll do with it. I: How stupid you are really! At my age, I can present it to any girl I choose. She will just love it and reciprocate with a bunch of adult diapers. I will accept it with gratitude. Incidentally, did you know that the Finance Minister has imposed a customs duty on adult diapers this year? Sorry, for this distraction. Me: Yes, maybe you are right after all. Anyway, my lottery experience has ceased to hurt. Let me tell you something else instead. As a child, I went to a P.C. Sorcar magic show. There was a number called X-Ray Eyes. Sorcar stood blindfolded on the stage reading out whatever people from the audience were writing on a blackboard. It is not impossible to read even if tightly blindfolded. I: Oh, come on, it’s an easy enough trick in the age of electronics. His assistant could be standing behind the wings and reading out details to him over a wireless system. He heard clearly through a hidden microphone. Ian Fleming used the idea in one of his James Bond stories. Me: I told you I was a child. This was long before the arrival of electronic age. I: Well, in that case he had probably employed the Gandhari trick. By the way, are you suggesting that justice is a form of magic? Me: I am suggesting nothing at all, just recalling events from the past. As a child once again, I was taken to a circus show where a man threw a set of sharp daggers at a girl standing against a wooden board. Not one of them hit the girl. Instead, they drew a neat outline of her attractive figure! That man was blindfolded too. Even if I were to assume that he was using Sorcar’s magic eye trick, I am sure that it needed a lot of practice for him to pierce through the board without hurting the girl. I: Should Lady Justice behave then like the clown you watched in the circus? It seems you want her to throw her sword around without removing her blindfold, don’t you? What a great idea! Who will ensure that she goes through practice sessions? Also, how do you know that your guy never hit the girl? Did you ever get to see her again in your life? Going back to practice though, perhaps that’s what our judges are engaged in now. The judgements will hopefully be delivered once their practice sessions are over and they are ready for the real show. It could take an eternity for them to reach that stage. Me: And while we wait in the queue, shall we order the pizza? Justice could be delayed, but Pizza Hut always delivers on time. Don’t you know what Omar Khayyam had to say on the matter? I: Omar Khayyam? He had a view on justice did he? Me: No, no, not on justice, but on wasting time idling over problems that will remain unsolved forever. I: Well, what did he say? Full of wisdom, don’t you agree? So let me call up Pizza Hut … OK, done. And as we wait for the delivery boy, let me reveal to you a lesson I learnt through experience. Neither justice nor luck has really evaded you and me. Consider yourself fortunate that we can order a pizza anytime we wish to, when millions of children in Africa and India are dying of hunger. I do not know about dinosaurs, but ever since mankind began to evolve, justice has been reserved for the privileged few. The Spanish filmmaker Luis Buñuel was probably not far from the truth when he represented God’s son himself as a blind beggar! I: Is that what he did? How so? Why can’t I remember? Wasn’t I there to watch the film? Me: Yes you were, but you fell asleep. Buñuel was invited to Spain in 1960 to make a film and he produced Viridiana. The movie has a scene that imitates Da Vinci’s Last Supper, with a blind beggar occupying what presumably should have been Christ’s own seat. A film clip leading to the scene is available on the net. Search it out if you are interested. The authorities in Franco’s Spain banned the film as soon as they saw it. God though didn’t prevent it from being smuggled out of the country. I: You mean God is not unjust then, is he? Me: I don’t know about justice, but it looks as though he is pretty powerless. He cannot prevent parodies about him from winning prizes in the world he created himself. Buñuel won the Palme D’Or for the film at the Cannes International Film Festival. Simultaneously of course, the Vatican’s official newspaper published an article describing Viridiana as an insult not only to the Catholic Church, but to all Christianity. I have no idea where justice lies, at the Film Festival or at the Vatican’s office. I: Well I guess the Hindu gods at least have never been denied vision. They are safe. They can see, even if they are powerless to prevent mischief. Me: Oh no dear, not at all. Go and visit the Tirupati shrine. The idol of Lord Shri Venkateshwara stands blindfolded. And I wish I knew why this is the case. Even the Americans found out about it. Or else should they have come up with a personalized postage stamp depicting him? I: Will a stamp anointed by a blindfolded God know where the letter needs to be delivered? Anyway, let me leave that problem alone. But did you notice that one pan of the scale the lady holds is heavier than the other? Me: Indeed it is … now that you point it out. Wonder what that signifies? Me: You are the one who’s being frivolous now. Listen, it probably means that criminals are more susceptible to gravitational pull than honest people. The latter reside higher up in the atmosphere, closer to God. I: Nothing of the sort. You are naive. 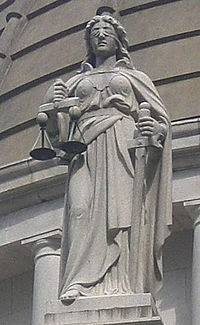 It just shows that, being blindfolded, Lady Justice cannot differentiate between small weight differences. She would know only if the weight differential were significant. And while we are at it, let’s not overlook the possibility that the scale itself could either have been tampered with or imperfectly manufactured. Me: You are far too cynical. Perhaps you are right though. But let us not blame it on Lady Justice alone. It’s mankind itself that needs to be questioned. I: Yes, I agree. Lady Justice is no more than a symbol of universal INJUSTICE. Q.E.D. Nonetheless, we’ve been blaming women alone. Even Shakespeare was guilty of this fault. Me: Ah! The plagiarist is back I see. Go ahead, let’s hear Shakespeare’s opinion concerning Lady Justice. I: Not Lady Justice, I was thinking of ladies in general. He’d said: Frailty, thy name is woman! Me: Oh no! Not again. You are about to start yet another circle. I am tired and more hungry than tired. Fortunately I am neither blind nor blindfolded and our window reveals that the pizza chap has arrived. A pizza in hand is worth more than several ladies or non-ladies in the bush. I will answer the door right away. I: Please do so. In the meantime, let me treat you to a song, now that I don’t feel sad anymore. Me: OK, but make this short and once you are done singing, I command you not to open your mouth except for eating. Me: Ha! I wish you could sing as well as the Beatles. But you are a plagiarist, you can never match the original. And now, here’s the pizza. Not one more sound I warn you! Write it all up if you wish to, but few will read, rest assured. People have better things to occupy themselves with than reading your endless nonsense. From Ma’at to Lady Justice to Gandhari to Fortuna to the cinematic Blind Beggar to the circus sword thrower…..a grand rambling tour, suffused with warm wit and merry ribbing. An enjoyable read. Also, informative – I’d never heard of that quaint tale of Gandhari’s peek-a-boo gaze scorching Yudhishtira’s fingertips ! Nor had read Russell’s sardonic critique of the nuns’ bathing habits ! LOL ! And you left me ruminating, still : “Why should a blindfolded woman be more righteous than a blindfolded man?” !!!! That was a rib-tickling piece that definitely draws a grin to your face, make your shoulders shake and set your head to nod. ..!!!. Thank you Panchali. Few people would have the patience to read this long, long piece. So, I was careful in choosing the people to whom I had sent it. The first person was another e-friend in Bangalore. She writes well, but I don’t think she writes much anymore. The other was you, who also writes well and still writes!! Thanks again for liking it.